Simply spread generously on affected muscles and gently massage. Menthol 30mg/g and Peppermint Oil 5mg/g – Both menthol and peppermint soothe tired and stiff muscles. Menthol has additional benefit of providing cooling relief, which is of particular benefit for strained muscles. Arnica Oil 10mg/g – Arnica supports recovery for bruising and trauma. 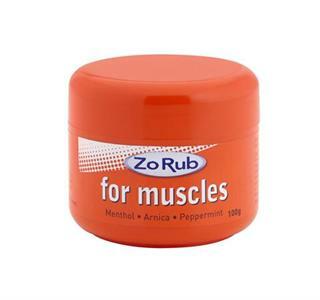 Zo Rub for muscles also contains St Johns Wort extract and calendula oil, which can soothe and relax stiff muscles, and vitamin E and beeswax for healthy skin. Zo Rub for Muscles is available in a 100g tub.